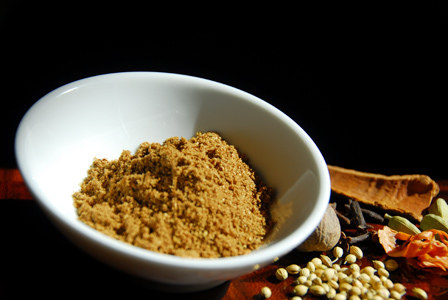 Chaat masala is a unique spice blend used traditionally on street foods and chaats. 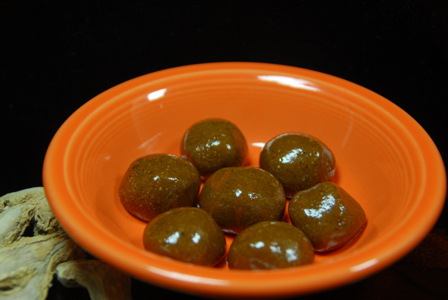 Even though there are tens of blends for chaat masala, this is a simple version of it. The key to chaat masala is black salt, which gives the masala a key sulphurous hint. Sourness comes from either amchur powder or from the dried pomegranate seeds. Makes: 4 1/2 tbsps of Chaat Masala Powder. Toast cumin and coriander seeds until aromatic and ground them into fine powder once cooled to room temperature. Combine all the ingredients and store tight in a sealed jar. Use chaat masala as needed. Notes: Make sure to use the fresh spices for good taste. Suggestions: Adjust the amount of spices according to the preference. Variations: Cardamom, dried pomegranate seeds powder etc can also be added. Other Names: Chaat Masala Powder, Chat Masala. Biryani masala powder is a spice blend which is used while making most kinds of biryani. There are hundreds of versions for biryani masala powder while this particular one is basic and consists of cloves, cinnamon, cardamom, coriander seeds, nutmeg and mace. Makes: around 1 Cup of Biryani Masala Powder. Grind all the ingredients into fine powder using a spice blender. Store the biryani masala powder in a tight fitting jar. Biriyani masala stays fresh for 4 – 6 months. Notes: Make sure to grind everything into fine powder. Suggestions: To reduce the heat, reduce the amount of cloves a little. Variations: You can also add caraway seeds, fennel seeds, cumin seeds, black peppercorns to the spice blend if you wish. You can also add powders like dried ginger powder, red chile powder, turmeric powder etc. Some spice blends contain whole ingredients like dried plums, bay leaf / masala aku, black cardamom etc..
Other Names: Biryani Masala Powder, Biriyani Masala Powder. Rasam is an essential course of Indian meal. Rasam rice is preceded by curd rice which is the last course of the meal. Rasam recipe varies mainly in its spice blend. In this recipe of rasam, dal is not used in any way. Its simple and instant rasam made with few spices and preferably tomatoes. This is called one time rasam because once this rasam is boiled, it cannot be boiled again. Wash, chop and lightly mash the tomato. Use tomatoes that are sweet and ripe. Clean, wash and chop cilantro. Peel and lightly mash the garlic pods. Grind coriander seeds, cumin seeds, black peppercorns into fine powder using a spice blender. Take 4 cups of water in a mixing bowl, add ground spice powder, mashed garlic pods, tamarind extract, tomato, cilantro, curry leaves, asafoetida, turmeric powder and salt. Mix thoroughly and put on high flame until the water comes to a boil. Boil the rasam for less than a minute and remove from heat. Serve immediately over plain steamed rice and dollop of ghee. Notes: Don’t heat the rasam again, mix everything together and heat when necessary. 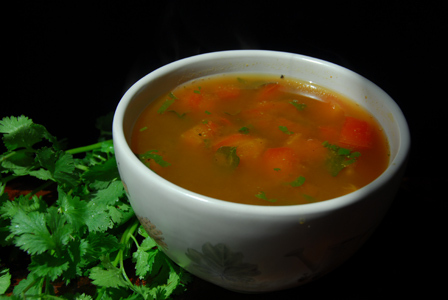 Suggestions: If rasam is too sour, reduce the amount of tamarind or add more sweet tomatoes. Variations: Some add oil to rasam while its boiling. Some temper the rasam at end with mustard seeds, cumin seeds, and whole red chillies to make rasam more flavorful. Other Names: Pongu Saaru, Pulichaar, Tamarind Rasam. 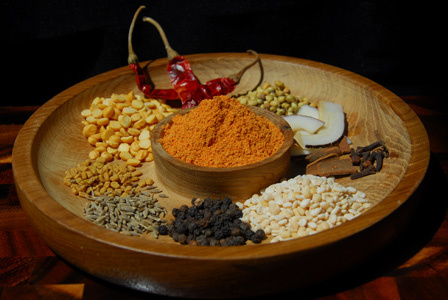 Curry powder is a blend of various ground spices used mostly in dry curries. There are tens of blends of curry powder. But the generic blend of curry powder contains urad dal, chana dal, coriander seeds, fenugreek seeds and dried red chillies. Here is the more complex version of curry powder with ten ingredients which has more heat than normal curry powder but versatile enough to suit any vegetable. Heat a heavy bottomed pan on low heat. Roast all the ingredients except red chiles and dry coconut. To make sure its done, smell the aroma or look for the change of color. Heat oil in the same pan, add broken red chiles and roast them until aromatic. Leave the dry coconut in hot pan to absorb the heat or make sure to roast them very lightly. Cool and grind all the roasted ingredients with sufficient salt into fine powder. 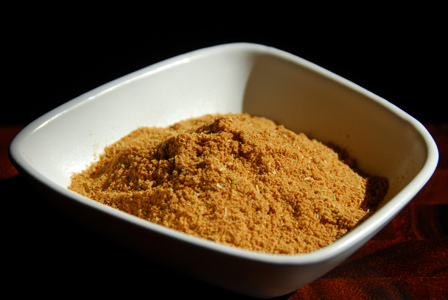 Refrigerate the curry powder (kura podi) in a tight jar for couple of months and use when necessary. Notes: Make sure not to over roast or burn any of the ingredients. Suggestions: If the curry powder is too pale, choose bright red Kashmiri chillies to give it some color or mix in some chilli powder at end of the grinding process. Variations: Some recipes call for asafoetida, turmeric, curry leaves etc… Adjust any of the ingredients according to your preference. Basic curry powder has almost an year of shelf life but because of the cloves this curry powder doesn’t stay good more than a couple of months. Other Names: Koora Podi, Andhra Curry Powder.